Seatac Airport plans a big new international arrivals hall. Real Change on the low income fare. Metro multilingual information has some translation errors. More bike storage on Amtrak Cascades. Capitol Hill Seattle asks mayoral candidates insightful questions about urbanism. Asking homeowners to help prevent mudslides on the tracks. Summary of the Lynnwood Link EIS. Mercer Island Station comments are obsessed with parking. A systematic way to evaluate TOD. TriMet thinks ORCA is too primitive for their next smart card. Just how empty are all those legally required parking spaces? Buying transit tickets by phone set to take off. Seattle not the only city to be getting a new bikeshare program. The dumb protectionist rule that killed Las Vegas-Los Angeles HSR. The arrivals hall project looks plain awkward. Arrive at S gates go up elevators/escalators, walk a relatively long distance on a walkway to get to the immigration counter. I assume you need to do your bags first? or do the bags flow over to the the new hall and THEN are checked through if you’re connecting? Japan does this. Its not uncommon to have two airport stops on a train line when the terminals are sufficiently far apart. Of course, Link has no other purpose than as a shuttle to the airport and it can terminate there. It’s not like it’s going to Des Moines or anything. And don’t imagine a spur. I don’t know what TriMet expects from ORCA. What exactly does a non-primitive card look like if ORCA is “primitive”? Tell that to Trimet, still with their (primitive?) paper tickets and (primitive?) physical ink validation. ORCA isn’t branded with MasterCard, Visa, AmericanExpress, etc. That makes it old school. Nevertheless, I think agencies have to develop some sort of in-house card, or share other agencies’ card system, in order to have a robust electronic payment system accessible to all. Problems with ORCA for expansion that Tri-Met hasn’t mentioned are the high cost of the card, the lack of products that cover all of Tri-Met’s pass categories, and the difficulty negotiating a revenue-sharing formula when you throw in a whole new set of pass cost levels. It hardly seems worth the effort to give up a chunk of fare revenue from Seattle tourists and commuters. In an open-loop payment system, a prepaid transit card is just a prepaid debit card (possibly restricted to reject non-transit transactions), similar to those already in widespread use as gift/prepaid cards, issued by Visa/Mastercard. How are transfers tracked in a system like that? Wouldn’t restrictions on the storage of credit card numbers make that more difficult? Our transit agencies need to avoid tying themselves to bank debit or credit card schemes. These schemes are expensive (up to 3% of revenue) and the newer schemes provide unnecessary fees aimed at consumers (e.g. CTA’s Ventra card). The future bodes for direct payment systems that don’t require the old school credit card networks. Companies like Dwolla with its innovative payment gateway and pricing could be the future. 3% sounds like a bargain to me. What Ventra fees, specifically, do you take issue with? Al: The important part is not that we use Visa or Mastercard, just that you’re paying with money as opposed to “magic transit points” (even if those points have a 1-1 correspondence with USD). I personally think that phone-based NFC is the most compelling option. You can set up your phone to pay using your choice of payment method; when you pay, you’re given a cryptographically-secure “virtual transfer”. The next time you board, you “pay” by using that transfer, and so long as it’s still valid, you’re not charged any money. For people who can’t afford a phone, or choose not to have one, we can continue using existing ORCA cards. As I understand it, the technologies are backwards-compatible. Once you factor in the fixed fee per transaction charged for credit card processing, it would extract more than 10% of transit revenue. We need to stop debating credit cards as the backbone of a cashless payment system. We’ll ignore for a moment that a lot of people use the credit cards to put money on their ORCA cards anyway. I think that people are only concentrating on the money transfer part of the equation, and forgetting about fare product structures: things like transfer rules, combination of fares passes with e-purse, zonal fares, … I think that the cash management side of the problem is realtively easy, the cost is elsewhere. I personally like the fact that the card is charged with transit coupons rather than cash, although I understand that others may not. It’s easier for me to give one to someone else and be reasonably sure that it will be used appropriately. It makes them less attractive targets to theft. I hate the idea of involving the CC companies for clearing unless something can be done about their high per transaction fees. Using a CC to put 25 bucks on a card is about a 4% hit. To pay a $2.00 fare it’s closer to 15%. 3% is not a bargain. Especially when technology can facilitate frictionless transfers. The only reason the “market rate” is 3% is because of the monopoly that banks have developed in cashless transfers. The company I mentioned before charges only 25 cents for transactions over $10.00. So you send $10,000,000 to someone using that service, the fee is 25 cents. Has it occurred to anybody that paying by debit/credit card can be even slower than cash? It would be nice if my ORCA card worked on things other than public transit. Like snack vending machines. With my $1.25 monthly pass, I would clean house at vending machines! How is dumping debris over the cliff not illegal? If there isn’t already a law requiring these homeowners to do a minimum to keep mud slides from happening, can we get something moving to save some low-hanging money? Likewise, how was digging into the side of a cliff to build a railroad track in the first place legal? I’m not sure of the exact dates that the Seattle to Everett portion of the GN line was built, but I think it was around 1890. In those days there wasn’t oversight or control of railway construction. If it worked–great, if not–try again. It also was perfectly legal in 1890 to dump the water from your swimming pool over the cliff and spill raw sewage into the local lakes and streams. But we’ve realized the foolishness of those acts and passed laws to regulate or prevent them. If homeowners are being negligent or irresponsible and their actions are causing mudslides and damage to BNSF/WSDOT property they had better change their ways or purchase really large liability insurance packages to cover the damage they are causing. I wonder how carefully everyone would start maintaining their property if BNSF or WSDOT through a few multi-million dollar lawsuits at the homeowners. It sure wouldn’t be popular, but it would be effective. I’m pretty sure most of the Great Northern between Everett and Seattle was built on fill at the base of the slope. I don’t think they cut into the slopes much, if at all. The next fare restructure *is* the ideal time to institute a low-income fare stabilization program, as it allows the other fares to go up more, and eases the transition out of zone-based and time-based fares. The low-income fare doesn’t need a fare reduction. It can just stand in place while other fares go up, so it wouldn’t be a hit on fare revenue, or be subsidized by other riders. The county council has moved the timeline for instituting the restructure back by as much as a year, which removes it from becoming a campaign issue for those standing for election or re-election this fall. Still, that just digs the hole deeper, widening the cut to higher than 17%, and wipes out this year’s additional projected sales tax revenue. I’ve been told that Metro wants to implement an electronic payment discount as part of the restructure, and that instituting the low-income fare could be tied to implementation of that across-the-board ORCA incentivization. I’ve also heard that the Kitsap model is what Metro is looking at implementing, but I haven’t heard specifically that it would be electronic-payment only, like Kitsap’s is. Election season is the perfect time to get some county councilmembers to promise that the low-income fare be electronic-only. Guess the rest of the city can pound sand when it comes to his energies. Interesting. So now it’s 1st or nothing with 4th/5th eliminated from consideration. They’re trying to stack the deck for mixed-traffic operation even though exclusive lanes are obviously necessary. Vague comments like “Most believe that mixed traffic operation will be necessary”. No funding is needed for a low income fare program. All anyone needs to do is what many Real Change vendors do now – plop ¢4 in the fare box, say “Sorry, thats all I got” and walk on anyway. Or pay nothing at all. Ask for a transfer and the driver is required to give it. We already have a low/no fare program. Its called zero consequences for fare evaders. Except for the humiliation of asking for it, or never knowing which drivers are going to give you a longer interrogation than others. Some drivers do stop the bus until you pay or get off or the police come. All this is fine for stereotypical tough guys but that’s only a small fraction of the poor, and it’s not fair to leave everybody else out with a blithe “Metro is free if you just don’t pay a fare”. Who is left out? Policy is “no fare disputes” period. Drivers are to issue transfers on request even if no payment is given. And humiliation? Most fare evaders are brazen. I seriously often see Real Change vendors right off if a day if sales refuse to pay, and the ones who drop pennies in the fare box act as if they paid full fare. And the gold paper flash passes are the biggest fraud off all second only to handed off, saved or altered transfers. There is no need to waste a single dime on a low income fare distribution program. We already have one. What exactly are you trying to accomplish here? Or is there no point, you’re just frustrated and this is your place to throw a tantrum? If the later, can you please do it elsewhere, the adults are talking here. We do need a Low Income option and it does need to be on ORCA. Who’s left out are meek women who don’t like confrontations, and law-abiding people who left their ORCA card at home or have run out of cash. They’re the ones who are not getting on the bus or agonizing over it. It’s not just all “brazen Real Change people”, and calling it that is like the people who want to eliminate food stamps and Medicaid because they can’t stand the thought that there may be one person somewhere who’s scamming the system, never mind that you’d dump off the majority of people who are honest. There’s also the issue of POP services like Link and (ostensibly) RR — get caught without valid POP on one of those and you’re not going to get a “no fare disputes” policy from the enforcer. We should be looking to expand pre-payment, and a proper low-income system is probably necessary to do that. There’s no tantrum here just a statement of fact. Arguing the need to have an expensive and complex low income fare program is arguing that liw income people dont ride at reduced fare or no fare at all right now. They do – daily and without consequence. There is no need for a wasteful program that will change nothing, only add cost to an already strapped system. Martin Duke made comparable arguments against the concept of system wide fare enforcement when elimination of the RFA was being considered. It would ultimately cost as much or more than it would save. What exactly is broken about the current system that allows free rides on request (or without)? How much would it cost to simply fix that – if it needs fixing at all? Wouldnt it be simpler and cheaper to just drop the illusion of fare evasion being illegal? Do like the hospitals do and post a sign on all buses stating that nobody will be denied transportation based on ability to pay? Its more honest, would remove the humiliation factor, keep drivers in line and be infinitely less expensive. No new bureacracy – just signs. I think the word you’re looking for is “donation”. @Mike Orr: Did you mean “meek people”, or are you actually claiming only women are meek? 12 comments and not one complaint about MI. I’m impressed. Call me when Man Bites Dog. I was amused by it. It shows how much Islanders are more driving-oriented than Bellevuites. But there’s still hope for a frequent circulator bus that at least some of them would use, no matter how much they can’t imagine it now. It’s also good to see Mercer Island offering to pay for the additional parking itself rather than insisting ST do it. Maybe if they put in a street car on MI or had the circulator bus have extra plush seats and wifi more people on the island would use it… I doubt it though. It’s not terribly surprising that Mercer Islanders are less than thrilled about Link. legal street parking near the proposed Link station is all but non-existant, and the P&R is severely undersized. Outside of downtown Mercer Island, the current transit provision is almost worthless, and Metro is talking about eliminating even that. On top of that, the State wants to charge to get to the closest usable P&R in Eastgate [South Bellevue is roughly as overcrowded as MI] so that they can pay for the 520 bridge. Oh and for destinations in downtown Bellevue Link is likely to be slower than the 550 because Bellevue doesn’t seem to want it. Really the only Islanders who will be better off with Link are Microsofties within walking distance of the station. Given all this, I don’t think it’s entirely unreasonable for them to take the somewhat parochial view that it’s an awful lot of pain for not much gain. I certainly sympathize with their concern that a new parking garage will get built and people will come from Bellevue to park there in order to catch a bus. If parking for residents only helps get Islanders out of their cars and on the train and reduces congestion/emissions, I’d consider that a win. People don’t come from Bellevue to Mercer Island to catch a bus. It’s just as easy to park in South Bellevue, and the P&R is bigger. People come from Kirkland, Bothell, North Bend, and points further away. Of course, let us remember that the MI park and ride is undersized because that is the way MI wanted it…. @ap: Actually S. Bellevue fills up about the same time as, or perhaps slightly before MI. Eastgate is much easier for parking, but has hardly any tunnel buses now. Fine if your destination is the ID, but the crawl to fourth, and traffic on fourth probably adds 5 minutes to the ride to Westlake. That said, I suspect you are right about where non Islanders are coming from. @Paul: you are of course correct. I thought that the city council had made a mistake then, but, in all fairness, an Eastgate sized P&R would have been out of character in the town center as it was then. Of course, knowing what private developments have been approved since, the decision seems insane. @William: You’re probably correct. I had forgotten that they built a garage on Mercer Island. My frame of reference is a decade old, when I bicycled past both park and rides every morning during commuting hours. So that’s who’s behind the new gosh-awful Sound Transit maps. Is that a LRT vehicle I see in that picture of the Sea-Tac arrivals? The track is inches away. The station is the better part of a mile. Not sure I understand your point–the proposed terminal expansion will be quite close to the southward extension of Link, as it’s located to the west of the existing A concourse (between there and 99, which is not much more than 100m). Now the station–yeah, that’s a different story. It’s a good 3/4 mile if you walk through the terminal; only about 0.4 miles if you could walk along 99, which of course you can’t on that side. Selfishly as I would use that new facility fairly frequently I’d love a second station there…since they can’t fix the original f up of the current station’s location. never mind, d.p.–I see what you’re saying re the location of the existing station as opposed to how close the track will actually be to the terminal at that location. I agree completely. For the most part, international arrivals means people carrying large quantities of luggage. Most of these are probably not Link customers anyway. The airport end isn’t so bad, since you can at least take a SmartCart right up to the station. It’s the lack of luggage racks on the train itself, plus the problem of what to do at the other end of the trip. Even if you have someone picking you up, it is usually easier for the driver to simply go to the airport than to deal with all the traffic getting in and out of downtown (the problem of driver and passenger finding each other tends to be more difficult downtown as well). Two hours ago, ASDF, I got off a jam-packed shuttle from the N satellite to the main terminal. Of the 100+ people on that shuttle, I was the only one to head toward Link. Ease and station location matter. You can deny this all you want, but the near-empty trains running to and fro every ten minutes prove you wrong. I have a gasoline related question. That’s sort of transit related, right? Before about the 1970’s, you could pump your gas first, then pay. Even with cash. Just pick up the nozzle, fill your car, then go in and pay. But sometime around the 70’s, gas stations stopped allowing that. They all became prepay. I understand there were two gas shortages in the 70’s, but adjusted for inflation, gas prices pre-70’s were no higher than they are now, so it can’t be that higher gas prices causes more drive-offs, because the prices are the same as in the 1950’s. So my question is, is it just that people are less honest today than in the 50’s, or is there some other reason gas is now pre-pay? Most likely the technology to accomplish prepay the pump dropped to a low enough price to be less than the cost of people leaving without paying. Because most people pay with a credit card or debit card, with a reader at the pump – just as easy to collect the data at the front end of the transaction instead of the backend, and there is no chance of theft at all this way. Those readers didn’t exist years ago. Full service was a lot more common in those days. Even if you pumped yourself, there was someone out there to make sure you paid. Also while gas prices aren’t really all that much higher in real terms than in 1970 (especially pre-tax prices), they were a lot more expensive (in real terms) in 1979 than in 1970, and it’s around then that the switch to self pump/pre pay started. That’s the real difference. Self-serve pretty much demands pre-pay. When I visit Oregon, they don’t need pre-payment. Another factor is that the gasoline business has changed a lot over the years. Back in the 50s, the folks at the gas station probably knew most of their customers personally. Nowadays, stations serve more customers with more pumps and higher volumes, but probably with lower margins. Back then, the station owner could give you grief next time you came in if you drove off without paying. Nowadays, they’d need to review the recording on the DVR and track you down from your license plate. I’ve got a question for y’all. Tonight on the northbound 574 at 512 P&R, I got carded. The driver noticed I was using a youth ORCA card, and asked me to show ID because I do look over 18 (I just turned 18 in May). I explained that I don’t have ID, and I don’t need it because both it’s not in the Sound Transit schedule book that I need ID ready to pay youth fare, and because I have a valid youth ORCA card, which required age-providing identification to obtain. She says those aren’t valid, because I could have obtained the card from a youth to pay a lesser fare, and they have had the ID for youth fare requirement for 8 years. She let me go, and I almost missed my transfer in Federal Way. My question is does Sound Transit require ID for cash payment, ORCA card, both, or neither? She insisted both, but that would kind of eliminate a benefit of an ORCA card. I will not carry around my passport for this; it’s ridiculous. Even if some people do transfer youth cards, it’s not like it’s going to hurt the agency. It punishes youth by potentially denying them a ride, and it punishes everyone by being late. When she said that I could have obtained the ORCA card from a youth, I thought she was joking! I could have done the same with non-photo ID (or even photo ID sometimes). Am I supposed to prove beyond the shadow of a doubt that I am under 19 RIGHT THERE, while the bus is running late? *let me go, as in “I’ll let you ride this once, but have ID ready next time.” I also didn’t have any cash in my pocket. If Sound Transit wanted to be able to verify ORCA cards were being used by their proper owners they should have a put picture on the ORCA card. It’s an obvious solution, isn’t it? My advice: next time a bus driver harasses you, ask her to either stop or call the police (or transit police, whatever.) I’m sure she’ll refuse to make a scene because she can’t take that risk. You are not personally responsible for Sound Transit’s lack of planning with their ORCA cards. I can’t tell her to call the police, it’s not an emergency. That would make me look stupid. What really miffs me is that she said that this policy has been in place for 8 years, which is quite specific. Except I don’t see that anywhere in the schedule book or website of Sound Transit (which governs the 574) nor Pierce Transit (which the driver of the 574 actually works for), so if she’s right, this is a major miscommunication on the agency(s) part. I do notice that Pierce Transit drivers tend to be harsh with youth trying to use cash without ID. I mean, come on, the economy is tough now, but do adults using youth fare, with or without an ORCA card, cause ANY measurable burden on the agency? What I meant by “call the police” was “put up or shut up.” Often times people will cause a stink about something but they’re not willing to actually take any action. If she refuses to call the transit police, then what is she willing to do? If she refuses to let you board, you should definitely file a complaint with Sound Transit. Good luck with that…even though I’d love to see it. I am wondering why I should continue to use mass transit anymore. Both on my way to work last night and on my way home this morning I had to deal with buses that were very late. I got to work late and git home half an hourr later than normal. I mean why? Drivers do not care. If they are late it is no big deal to them. They could not even start the routes and would not even get in trouble. I have seen them sit around at the first stop sometimes 15-20 after they were supposed to start. The rules are never enforced. I pay for my fare always. However, if you do not pay it is ok the driver will not do anything. 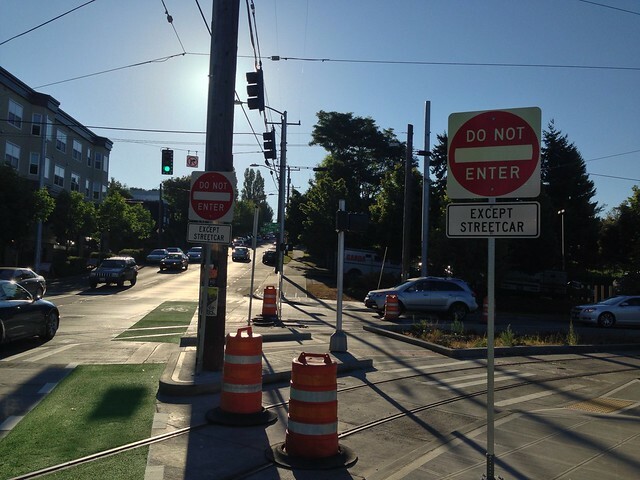 Stealing in encouraged by Metro and Sound transit. The facebook page telling what the daily transfer is so criminals can use reuse old ones is still in effect. These criminals are getting away with it and no one cares. Also while driving the code of conduct is not enforced. People blast music without headphones. If you ask them politely to please use headphones or to turn it down you are cursed out or, even worse, called a racist. You tell the driver and most of the time they do not make an announcement. I have been talked down to by drivers for asking. I know that as a South King County Resident I am a second class citizen in all of your eyes. Seattle is all that is important to you. So I know that this will be just laughed at and tossed. I just feel I need to point these things out. I am just sick of it all. With regard to the XpressWest HSR project that is now shelved, if the Federal Government is footing a large percentage of the funding for a mega-project, it is not unreasonable for them to demand particular requirements. A “Buy America” requirement while not in keeping with Austrian neo-liberal economics, is still quite a valid objective for a government to demand. That the funds it puts forward be used to develop and foster in country development. It would be interesting to find out if the Federal Department of Transportation tried to assist the XpressWest entity with lining up suppliers that could fulfill the Federal Requirement or did it simply leave it to XpressWest to find those suppliers on their own? On the other hand, XpressWest could launch a grievance that this rulemaking maybe out of compliance with the open markets requirement of the WTO. In theory, a “Buy America” requirement should reduce the net cost to the federal government in that the feds will recoup some of the cost when the contractors, their employees, and their executives pay income tax (although such revenue will be spread over the entire government, not go to the HSR fund). Whether the additional income tax revenue collected as a result of such requirements exceeds the higher cost of building the track to begin with, I will not begin to speculate. The “Buy America” provisions are disastrous *because there is no US rail industry*. It increases the net cost to the federal government, a lot. Now, *if we had a US rail industry*, like we did even as late as the 1950s, then Buy America might make sense. We don’t and it doesn’t. Federal government policy destroyed the US rail industry, and you can’t bring it back with “Buy America” policies. You would have to actually subsidize it directly. “Buy America” is stupid in this context: it’s like requiring that all cacao beans sold in the US be grown in the US; it’s not *feasible* or *reasonable*. It would have made sense to protect our existing railroad industry back in the 1950s, but decades of bad government policy destroyed it, and now “Buy America” is protecting absolutely nothing. You can’t apply protectionist policies when you have no industry to protect. In the field of rail, “Buy America” is routinely worked around by foreign companies setting up shell-companies in the US to do menial labor jobs, because nobody is going to waste their time doing actual high-value work in the US. Worst case is a company like Boeing decides to jump into the light rail business. However, just to our north Bombardier builds some pretty good equipment. They have in the past set-up manufacturing in the US (might still have some). Seems like if we are going to have a free trade zone then the provision should be Buy North American. Bombardier might have an in because of NAFTA. Give the Mercer Islanders a giant P&R (with housing on top) in exchange for increased height around the station. Would it be possible to build a garage on top of the highway, kind of like a lid? It seems fairly common in other cities. That area is desirable enough that some real TOD should be doable. And if tall enough, the views would be incredible. It’s always possible, it’s just a question of money. You’d be talking on the order of $50,000 or more per space. A University of Colorado Boulder team has developed a radically new technique that uses the power of sunlight to efficiently split water into its components of hydrogen and oxygen, paving the way for the broad use of hydrogen as a clean, green fuel. The CU-Boulder team has devised a solar-thermal system in which sunlight could be concentrated by a vast array of mirrors onto a single point atop a central tower up to several hundred feet tall. The tower would gather heat generated by the mirror system to roughly 2,500 degrees Fahrenheit (1,350 Celsius), then deliver it into a reactor containing chemical compounds known as metal oxides, said CU-Boulder Professor Alan Weimer, research group leader. Speaking of leaving Windows 95 behind…imagine walking on to a bus, and it recognizes you and charges you without you having to do anything. Finnish company Uniqul has patented and tested out a new payment system that lets you pay your bills with your face. When it’s time to pay up at a gas station or mall, don’t pull out your credit card; instead, look into a camera, and wait until it recognizes you. After that, it pulls up your information, you tap okay and the payment is complete. Is anyone at Sound Transit looking at Link boardings? It is almost impossible to get on a train in the tunnel during evening rush hour these days. The last two nights, after waiting through two impossibly packed trains, I finally walked down to Pioneer Square, where there is always some relief from the people deboarding to get on Sounder. It’s almost making me rethink the 36, which is blessedly spacious these days. Add a third car from 4-7.